Has done our Engagements and other photos as well. We love her and cant wait to see what the wedding day will bring. Everything else has been incredible. Angela was the best! We had the perfect amount of meetings set up before the wedding to figure out all the details. When we got our engagement photos we were such awe! Her work is beautiful! On our wedding, she was very professional and took charge and told us her vision. The sneak peek pictures were absolutely to die for. We couldn't be happier to have her capture our big day. From Misty and David. Our engagement session included our Dogs and other special details. Our wedding photos were beautiful, and though I did not want to go into high grass and my dress so glad I did, our photos are dreamy . Thank you for capturing our love story Angela. Our Engagements are wonderful! So glad we found you. You put my fiance at ease and that is hard to do. Love you! Thank you for the really nice review. Angela was AMAZING!!!! She did both engagement pictures and wedding pictures for me and my husband. She was so fun to work with, and made us both feel completely comfortable. Her pictures are beyond what I even hoped for. Would strongly recommend her for anyone looking for a photographer. Her work is incredible, and she is a GREAT deal for the quality she produces. Love her and can't thank her enough!! Thank you so much for the lovely review! Your day was beautiful! Angela did both or engagement session and our wedding! I am so in love with all of our pictures! She was very professional and took into consideration that one of our groomsmen was actually a large picture of my husband's deceased brother. She actually took an old picture of him and blew it up for us on a foam board so it could easily stand alone or be put into a picture frame!! It was absolutely perfect and she was so sensitive of the subject when it came to the wedding day. She made sure to include him in the pictures as if he were really there and that made all the difference in the world! I would highly recommend her to anyone!! Thanks for this great review Chelsie! Our photos are just like I expected. Perfect! So much variety. My mom is at a loss. Cant pick her favorites. We thank you from the bottom of our hearts. Thank you so much Isabell. Angela was amazing, not only the day of, but the weeks/months leading up. We only met with her twice, however, she made herself available to us and answered all of our questions from the first time we met with her! She is extremely personal and truly goes with the flow. After we got done with the formal pictures, we didn't even realize she was there still snapping away! She worked with us to adjust the picture schedule to fit our needs and didn't hesitate to offer great suggestions when needed! Not to mention that her pictures are amazing! She is so very talented and overall the best! You will not be disappointed with her! Loved her! Got just what we wanted. Go with her she is sweet and so talented! Our pics are the BEST! You got every moment. Thank you so much! My whole family is delighted! Thanks Mary for your reviews. It was so very much my pleasure! I hired Angela for my Engagement photos and Reception photos (we had a party of 2 destination wedding) we really loved our photos. For the engagements we were able to go to a park of my choosing and take my dog. Those two aspects made it to personalized and special. Outstanding experience!! I can't say enough great things about our experience with Angela. She is a professional. She was very flexible and understanding of what exactly we were wanting for our pictures. The quality and moments captured are amazing. We were more than happy with our choice to go with Angela. Would recommend her to anyone!!! Thank you. It was so great working with you guys. I wish you many years of happiness! I didn't know of Angela until I began searching for a photographer for my wedding. I called and set up our first meeting and instantly felt comfortable. She communicated with information to help get us prepared for our big day. Throughout the months before she kept in touch. As the day got closer she set up a venue walk through and went over the last minute lists of photos that I wanted. After the ceremony as we had many of the pictures to do she kept everyone focused to make it go smooth and as quick as possible. I had many guests at the reception who personally told me how they thought it was great to be able to get a quick photo with their own family while they were dressed up. Just last night I had someone say Wow your photographer was everywhere and took many neat pics! I would highly recommend Angela as her work are the visuals you will have to help remember the day! I'm so happy to hear this Jade. Your wedding was a blast. And we got so many amazing photos. I want to know if you ever need a photographer again when you have a big party out there. So much fun! I would recommend ACP to whomever is getting married. We originally had picked a day that she was unavailable and then changed our date to accommodate having her/and out of town family. I'm so glad we did. I feel like you have become a great friend Angela. Thank you Angel. Text me when you come my way...we will get coffee lady! Angela's work is breathtaking. She captured the most amazing day of our lives in a way that reflected our personalities. We will cherish the memories she preserved for us forever. Thanks Angela & Craig it was a joy working with you!! Loved our experiance. Thank you for the Beautiful wedding photos and you are so fun, thanks Angela. we will use you again! Angela is great! Very friendly and personable. She was flexible with the timing of our engagement photos (weather was not on our side) and the quality exceeded our expectations! No complaints! Thanks Rebecca. You were glowing. Gorgeous! I couldn't be more pleased with my wedding and engagement photos. Not only is Angela a fun photographer, her work is romantic and special. Our experience with our Wedding photographer was beyond great! She was fun and very attentive and kept things moving quickly so we could get back to our reception. We LOVED our photos. Thanks so much to you and your 2nd photographer Marie. We loved everything about you day! Angela's photography was absolutely amazing. Beautiful pictures and quality. Was a pleasure to work with. So friendly and upbeat. I would definitely recommend to anyone. Thanks for capturing amazing one of a kind photos. Angela did a wonderful job with my wedding! She was willing to travel to my out of town venue. She came early and stayed late. She was very flexible, friendly, and helpful. I was very very pleased with all the photos she took. Her creative eye and knowledge of best ways to group people and edit photos is outstanding! You will not regret hiring Angela to make the priceless keepsakes of preserved memories from your once in a lifetime day. Angela did a fabulous job on both our engagement photos as well as our wedding day photos! We have received so many compliments on all of our photos and we couldn't be happier with them. I would highly recommend Angela to anyone and everyone! I'm blushing! Your a doll. And as gorgeous as one too! 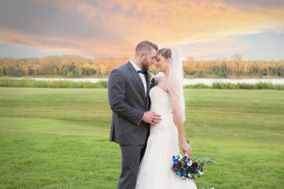 Angela did an amazing job on our photos and did everything we wanted! She is honestly the cheapest photographer we could find that would give us more bang for the buck with quality work! She is also amazing to work with and very flexible!! I highly recommend her for any wedding!! Thanks for all you did Angela. I'm not gonna lie I miss your dogs. Thanks for letting me be creative!